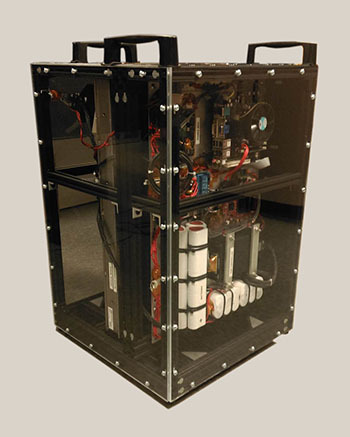 December 11, 2014 – Southwest Research Institute (SwRI) is preparing to unveil a new, miniature portable solar observatory for use onboard a commercial, manned suborbital spacecraft. The SwRI Solar Instrument Pointing Platform (SSIPP) will be on exhibit at the fall meeting of the American Geophysical Union (AGU), December 16-19, at the Moscone Center in San Francisco, California. Using reusable suborbital commercial spacecraft for the SSIPP development effort improves on a traditional space instrument development process that goes back to the dawn of the space age, according to principal investigator Dr. Craig DeForest, a principal scientist in SwRI’s Space Science and Engineering Division. The first SSIPP space flight will search for “solar ultrasound,” which DeForest said is a phenomenon first observed in the early 2000s by the Transitional Region and Coronal Explorer (TRACE) spacecraft. The “ultrasound” is sound waves with 10 second period, some 18 octaves deeper than ultrasound on Earth, and forms visible ripples in the Sun’s surface layers. The waves are difficult to detect without space instrumentation, because the tiny, rapid fluctuations cannot be separated from the confounding influence of Earth’s turbulent atmosphere, he said. The first test flights of SSIPP will be aboard a general aviation aircraft during the spring of 2015. It is scheduled to fly on XCOR’s Lynx suborbital spacecraft immediately on completion of XCOR’s flight test program in 2015.